Easy Ways to Sort Your Home Office - Home Sorted! If you ask us, it’s too easy to forget about the home office when it comes to getting sorted. But you shouldn’t. 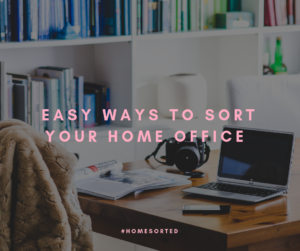 Here we share with you some of our favourite and easy ways to sort your home office today. How many times a day do you bring excess paper into the house? Junk mail, newspapers, magazines, flyers from your kid’s school – the paper trail can be endless if you’re not careful and it can clog up your home office even easier. Get into the habit of moving through your home office with a waste paper basket each evening. Toss everything you’ve read and anything you no longer need. The remaining papers should then be filed away (more on that later). A great way to sort your home office is to use containers or baskets to store stationary supplies and like items. This is especially handy if you have kids who are often searching for craft supplies for school assignments. We recommend containers or baskets as they also look fantastic stacked or placed on bookshelves. When thinking about home office organisation, it’s a good idea to consider which items you use frequently and together. If you’re always reaching for your notepad and pen, it’s a good idea to keep these in close proximity. The same goes for a multi-purpose home office. If your home office doubles as a study area, it can be a good idea to designate different sections to different family members. This can be as simple as giving everyone their own shelf or basket to store items they require. One of the biggest culprits for home office disorder is files – and the lack of a clear filing system. We don’t believe that one system is better than another, but we do believe you need to have one in place. Spend an afternoon sorting through your hard copy files and ensuring they all have a home. Then spend another afternoon cleaning up your electronic ones. You won’t regret this in the long term. Finally, if you’re short on space within the home office, consider wall shelves for some much-needed storage space. These are especially beneficial when installed above your desk or work station. Are you ready to tackle your home office now? We hope so!